Kobe Bryant owns a 2012 Ferrari 458 Spider like the one that has just received the “Best Sports Car and Convertible” award from The Sunday Times Driving in the UK. The Ferrari 458 Spider received the prestigious award from one of the UK’s most influential newspapers and was announced in a special edition issue celebrating the Top 100 Cars. Bryant who also has numerous awards, was spotted driving his new convertible 458 Spider as he was leaving a recent Los Angeles Lakers training camp. It was reported here back in March, that Bryant had just purchased his new Ferrari 458 Spider and paid $329,000 cash for the sports car. The Lakers MVP paid a bit more than the sticker price because he had to customize the roadster to accommodate his 6'6" NBA frame. But for Bryant who has one of the top salaries in the NBA, it was just chump change to pay an extra $100,000 to get the needed changes made by Ferrari. An athlete of Brant’s caliber, would certainly be drawn to an “athletic” car like the 458 Spider. The 458 Spider is the perfect supercar for an NBA MVP player. Whether you agree with Brant’s personal lifestyle or not, he is an exceptional athlete. 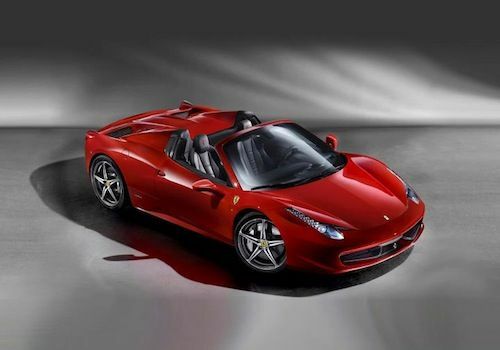 Like Bryant, the Ferrari 458 Spider has some exceptional athletic qualities. Like Ferrari’s other mid-engined V8 sports cars, the 458 Spider continues in that tradition, but this is the first time that a mid-engined sports car has featured a folding hard-top. With Bryant’s long frame, he probably wouldn’t fit in the hardtop 458 Italia. The LA Lakers superstar’s 2012 Ferrari 458 Spider is motivated by a 4.5-liter V-8 that sends 562 horsepower and 398 lb ft of torque to the rear wheels. The V8 is mated to a seven-speed, dual-clutch automated manual transmission. Ferrari notes it will go from 0-60 mph in just 3.4 seconds. Like Bryant’s quick bursts of speed on the basketball court, the 458 Spider is one of the quickest cars on the planet. The 458 Spider shares another thing in common with Lakers guard, it now has yet another trophy in it’s cabinet. The supercar has also won the BBC Top Gear Magazine’s “Cabriolet of the Year” in 2011, and two consecutive awards from the International Engine of the Year in 2011 and 2012 for the “Best Performance Engine” in the category over 4 liters for the naturally-aspirated 4.5 liter V8 which is shared by the 458 Italia. It shouldn’t be a surprise that Kobe Bryant drives the 2012 Ferrari 458 Spider. The superstar has a lot in common with the supercar. Watch the short video clip of Kobe Bryant as he leaves the Lakers practice driving his Ferrari 458 Spider last week.